Until a few thousand years ago, creatures that could have been from a sci-fi thriller—including gorilla-sized lemurs, 500-pound birds, and crocodiles that weighed a ton or more—roamed the earth. These great beasts, or “megafauna,” lived on every habitable continent and on many islands. With a handful of exceptions, all are now gone. What caused the disappearance of these prehistoric behemoths? No one event can be pinpointed as a specific cause, but several factors may have played a role. 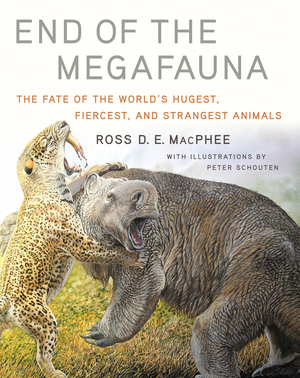 Paleomammalogist Ross D. E. MacPhee explores them all, examining the leading extinction theories, weighing the evidence, and presenting his own conclusions. He shows how theories of human overhunting and catastrophic climate change fail to account for critical features of these extinctions, and how new thinking is needed to elucidate these mysterious losses. Along the way, we learn how time is determined in earth history; how DNA is used to explain the genomics and phylogenetic history of megafauna—and how synthetic biology and genetic engineering may be able to reintroduce these giants of the past. Until then, gorgeous four-color illustrations by Peter Schouten re-create these megabeasts here in vivid detail.